To search for a perfect solution is a habitual activity of human nature. Whether it is usual task completion or the daily life activities. How come keyword research could escape from that? What keyword research stands for? Keyword research is the practice of identifying the terms and phrases which can be most relevant for our search topic for SEO strategy. Keywords can be grouped based on number of words in phrases. The more keywords in phrases makes it more easier to rank as they reflect specificity in keyword search. E.g. shoes – a short phrase is generic as compared to men’s leather shoes for sale which is more specific. How to select keyword phrases for a start up? While selecting keyword phrases we also have to consider the brand name behind the business. If its established brand then its more easy to drag traffic to the website. Consider there is requirement of Apple Iphone X in Mumbai. As Apple is well known brand worldwide customer will directly enter ‘Apple Iphone X in Mumbai’ in search engine to get the result. In such a case website traffic is generated directly to Apple Iphone website. However if there is scope for brand development, we need to use combination of generic and specific keywords. To select keywords we must do site analysis and also consider expected outcomes from keyword ranking e.g. we only want website traffic or we want good number of leads to be converted into revenue. Contact handmade product suppliers in India. Which keywords I should select for industry which has less awareness among public? Keyword research should reflect end user’s perception behind the search. For example, if I am searching for 3D printing industry then I should know that which keywords I should select for ranking. As far as this industry is concerned the end user is vast. It is applicable in every industry including medical, architecture, education, automobile, product design and defense. In such a case we should know what customer is expecting to search for instead of industrial terms that are known to 3D printing personnel. They know this term as additive manufacturing or prototyping or rapid prototyping. However, end user can search for customized products, sculpture, gifts, trophies, 3d models, prototypes, 3d selfie, automotive parts manufacturing and so on. So our keyword phrases should be mix of specific and generic words. What are the steps to follow for Keyword Research? There are many keyword research tools available free online. We can chose to select any keyword search tool based on our convenience and need. Also we can use combination of search tools to get the result if we are stuck with the problem. Let’s summarize the one of above keyword research tool Google Adwords. First we have to sign in into Google Adwords. However as we are interested in keywords we need to click on settings icon wherein we will find Google Adword keyword planner. Just enter the related search terms and get all related keyword phrases for planning your SEO strategy. Step 2: To list up relevant topics of concerned business. We can enter up to 3 keyword phrases into Google Adwords at a time. This number can vary in other search tools. If we are not getting enough number of relevant keywords for our business, we can take help of google search. When we enter some words into google search engine, we experience many related search terms shown. There can be thousands of keywords shown as result of keyword phrases entered into search tool. We need to select perfect keyword phrases which will display mix of head terms and long tail keywords. 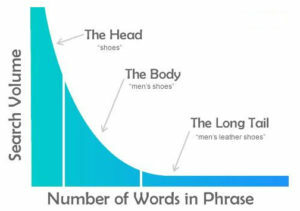 We should always consider both types of keyword phrases industry specific words and end user specific as explained earlier in this article. From nearly 1000s of keywords we can select best 20 keywords phrases for our SEO strategy. As we get list of relevant keyword phrases from Google Adword search tool, we need to check for competition, bidding rate low to high for final selection of keyword phrases. The searches should be high and competition should be low to get excellent SEO result. However if competition is high, bidding rate increases and we need to pay that much amount per click. Hence we should first do competition analysis for selection of keyword phrases. Once we are done with keywords selection, we need to update keywords list periodically to cope up with concurrent trends of the market. It can also help us to narrow down list of keywords from thousands to ten. We get idea of the terms which are trending upward and thus we can shift our focus with our SEO strategy.